Get Legendary Studio Tones from your Tube Amp — Anywhere, at Any Volume. With decades of analog hardware engineering expertise, Universal Audio’s dream team of engineers set out to design a reactive load box that retains the tone, dynamics, and feel of your tube amp — no matter how much it’s attenuated. The goal was for your tube amp to “see” OX as an actual speaker — with continuously variable impedance and response — so you don’t lose a drop of tone or playing dynamics. OX’s front-panel, six-position RIG control allows you to quickly choose from complete setups — including emulated speaker cabinets, close mics, ambient room mics, and up to four simultaneous studio effects. OX is also the only guitar recording system to offer a complete selection of expertly placed room mics, giving you the authentic experience of pushing air while recording your cranked amp in a world-class tracking room. UA’s groundbreaking Dynamic Speaker Modeling faithfully emulates speaker breakup, drive, and cone cry — an essential ingredient to authentic tube amp tones. Using the Speaker Breakup knob in the OX app, you can control the harmonics and sonic complexity that occurs only at certain frequencies and volume levels on various speakers — far beyond a static Impulse Response system — giving you the same sonic phenomenon that occurs with a real speaker cabinet. Most guitar products do digital awkwardly. They’re ugly and hard to understand. The OX software app, on the other hand, offers slick, intuitive control over all of OX’s RIG settings via Wi-Fi — letting you tweak, store and recall hundreds of presets from your iPad or Mac. You can then save your six favorite tones onto OX’s front-panel RIG knob for instant recall in the studio or at a gig. Not only does OX Amp Top Box feature a front-panel headphone jack for silent practice with your cranked tube amp, it also sports a bevy of connections for all kinds of recording and live workflows. Stereo S/PDIF digital outputs via RCA and optical TOSLINK, as well as balanced TRS stereo line outputs with front panel level control, give you the necessary connections for studio monitors, DAW, or live mixing console inputs. Love this thing, it sounds fantastic, it has great intentions and it’s versatile. But there are a few things that I have issues with. It should have XLR connectivity to be truly a pro product. Physically it is a problem for me to have a good placement for it in my studio, it should be rack mounted. It bumps of the wifi network regularly and need resetting. I wish it had more than one amp input. It should have higher sample rate on the digital output. I wish the on/off switch was on the front. That said, now I can’t work without it. It’s here to stay. Rock on! This is now one of my favorite pieces of guitar gear. I have it in a rack/amp head case for gigging, going straight out of the L&R outputs to FOH, and it works so incredibly well with my Fender Prosonic head. The cab simulation adds a bit more amp color than I would like (i.e. the vox speaker adds more of a vox-y sound than just a straight cellestion blue would, but it does transform any amp into something completely useable. A remarkable piece of equipment for the studio or on tour. Crystal clear sound that absolutely rivals any Kemer or Helix amp sound. My sound engineers always wonder why there are only symmetric instrument outputs and no XLR. By using a DI-Box sound is not getting better. To avoid that a cable XLR female to instrument symmetric is needed. For such a price an XLR plug should be possible. think highly of the UA stuff but this seems to be not well thought out. Picked this amazing OX box up in January. I use every aspect of this product. It gives me amazing attenuation on all of my amps. I now have the ability to use headphones through all of my amps as well as having a separate volume for headphone output. The App and the software is extremely good and customizable. My only gripes are the need for guitar cabinets with V30 speakers. As well as sometimes having issues with the OX connecting to the app via my wifi connection. Yes, I'm using comcast Xfinity internet with a 2.4 speed connection. AMAZING only for iOS users? je l'ai acheté pour l'utiliser comme atténuateur ( il y excelle ) et je m'en sers finalement comme simulateur de HP. je n'ai jamais entendu mes amplis avec tant de précision, je n'ai jamais eu tant de contrôle sur le volume. c'est juste fabuleux. Perfect for the studio, but not for live use. There are many reasons against it for live use and the main one is the large volume steps in the attenuator. I tried using it for a wet dry wet setup, but was unsuccessful since the dry was either too quiet or too loud. I also fear that any liquids can get in through the vents totally destroying the box. I'm also keen to know if the footswitch option will be implemented and would be used for changing rigs - however, currently switching between rigs is too slow, so when you go into the lead break or switch to something ambient there will be a one or two second delay for the new rig to cut in. I really want UA to be a leader in this product just like they are in the rest of their range. It is a solution that many have been waiting for and I now think they have missed the opportunity as another (as I regard) inferior manufacturer have taken advantage of the missing features of the Ox. UA have got to realise that the Ox is a solution for live gigging usage which is a larger money spinner that for studio. Still missing V30’s. Any updates including this in the near future? Really had my hopes up for the OX. There is not much to say. This device is perfect. I've been waiting for this all my life! I have been through almost every possible way to have a guitar sound into a headphone, for the past 35 years! This is so far the best solution. I must admit that lately there have been some pretty good sounding emulators, but the big problem with almost all of them is that they don't feel like the real thing., there is is something very special that happens when you plug a guitar directly to an all tube amp that hasn't been emulated yet. Unison plug ins gets closer. All internet comparisons that compares real amps with emulators all depend on how close is the sound, in my opinion that is useless since sometimes the emulations sounds better than the real amp. Things that I love is how the different guitars preserves their unique personality and playability, it's easier to play and you just don't have to fight to get the sound you want. I'm very thankfull to be able to experience such an amazing setup. Every note is blooming and sustaining beautifully. My advice is stop purchasing amp models and get an OX and if you don't have a tube amp go get a 15 watt amp and one analog OD peddal and you'll never look back. The just right one I need just right now! Now I can crank up my tube amplifier without annoying neighbors! So many amp simulations out there, but nothing can replace real guitar sounds from hardly pushed tube amplifiers. And also, I can record my guitar tracks like I'm in high-end record studio with various guitar cabinets and mics! Soundwise there is nothing anyone could teach the guys from Universal Audio. After 25 years of professional playing and using all the stuff that is available (including the Kemper profiler) in both studio and live environments I think UA raised the bar again. For me personally the winner is the combination of features. I see people comparing stuff and listening very close to what sounds best, but that is subjective. The combination of finding the sweet spot of an amplifier, switching (fantastic sounding) mics and cabs in a blink combined with top notch converters. That is what's helping the actual player and that is what it's all about. 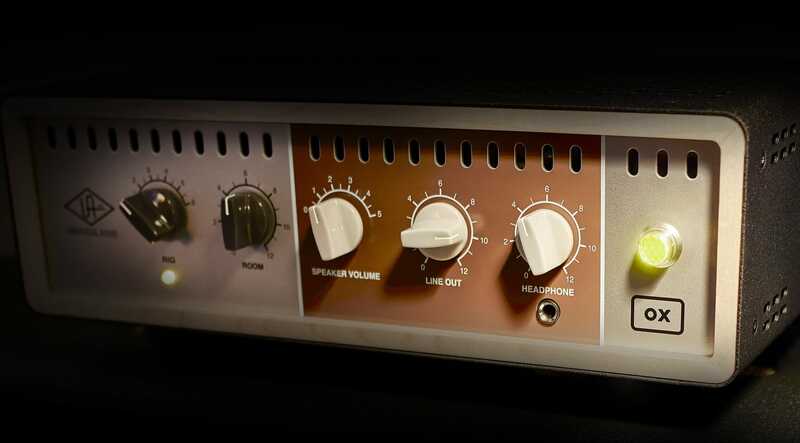 Real tube compression is one of the most important things when talking about sound and the actual 'feel' of an amp. That is something a profiler doe NOT own. Period. 5 stars for me. Brilliant product. OX ist eine Reactive Load Box, die zum Röhrenamp verschiedene Boxen simulieren kann und diese dann perfekt mikrofoniert ausgibt. Man muss kein Cabinet anschließen und kann so den Amp für Aufnahmen sehr schön am "Sweet Spot" fahren, oder man schließt eine Box an und passt diese durch Drosselung an die Location an. Die Klangqualität ist spitze im Vergleich zu ähnlichen Loadboxen, die ich getestet habe. Universal Audio sind mit ihrer Studiohardware und Plugins qualitativ ziemlich gut aufgestellt und entsprechend ist der Raumklang und die Mikrofonsimulation großartig gelungen. Die Kiste ist sehr einfach zu bedienen (wenige Knöpfe, Einstellungen über die App) und ist aus meiner Sicht die perfekte Ergänzung zum Lieblingsamp, sowohl live als auch beim Recording. Sieht auch schick aus. Der Mischer kriegt ein symmetrisches Stereosignal, aufnehmen kann man perfekt per Digitalausgang. Das Ganze ohne Nebengeräusche und mit 3 Mikros oder DI gemischt, wie man es haben will. Es gibt 17 Cabinets und 6 Mikros, die kann man in 3 Kanälen (2x direkt, 1x Raumklang) anordnen. 2 Mics sind trocken ohne jegliche Rauminformation, daher sollte man in den meisten Situationen etwas Raum dazugeben. Bei Aufnahmen lässt sich dies auch später nur sehr schwierig nachbilden. Hier geht es auch eher um Raumreflexionen als um Reverb. Wichtig ist zu erwähnen, dass der Raum, die Cabinets und alte Mics von UA verwendet wurden und dies den Klang bestimmt. Wer also gern im eigenen Badezimmer aufnimmt, muss stark mit dem EQ und Raumhall tweaken oder sich auf den anderen Raumklang einlassen. Und man sollte den Klang im Vergleich zu einem mirkrofonierten Amp im Mischerraum sehen! Direkt vor nem Fullstack ist der Spieleindruck natürlich anders. Es gibt praxistaugliche Presets als Ausgangsbasis, die z.T. wirklich authentisch Albumsounds nachbilden (es ist verblüffend, wie man mit dem Aufnahmeraum den Ampcharakter verändern kann!). Schon der "Speaker Drive"-Regler ist magisch!! Cabs und Mikrofonierung lassen sich sehr akribisch verstellen und bei Bedarf kann man noch EQ, nen 1176, Delay oder ne Hallplatte drauflegen. All das geht natürlich auch nach der Aufnahme, die Plugins sind nahezu identisch mit den UAD2 (bietet sich z.B. bei der Hallplatte an). Bin total begeistert und werde wohl nie wieder ein Mikro vor meine Box stellen. Beim Gig kann man super der Amp aufreißen, die Box dann auf ne gute Monitoring-Lautstärke drosseln und den mikrofonierten Ausgang an den Mischer geben. Den Raumklang (3. Mikro) kann man dann mit dem Regler vorne nach Bedarf / Location anpassen. Nachteile: Zurzeit kein Celestion Vintage 30 zur Auswahl (gehe davon aus, dass er später in Updates zur Verfügung gestellt werden wird, da sehr beliebt, es gibt aber auch gute Alternativen). App nur für OS-X und iPad, man arbeitet wohl an anderen Formaten. Die App ist allerdings wirklich spitze gemacht und sehr bedienerfreundlich. Ich bin sehr gespannt, wie sich die Plattform entwickeln wird - mit 3 USB-Ports und Fussschalteranschluss kann hardwareseitig auch noch was kommen. Dementsprechend ziehe ich keinen Stern ab. Teuer ist der OX, aber man sollte dies in Relation setzen: mind. 3 gute (R-121) Mikros, Preamps dazu, perfekter Aufnahmeraum, perfekte auslöschungsfreie Mikrofonpositionen, Amp aufgedreht. Bei OX ist das jederzeit, auch live, so einzusetzen und rekonstruierbar. Schön ist, dass die Kiste einfach super zu einem guten Röhrenamp passt und ihn dann flexibel und bei Bedarf ohne Box einsetzbar macht, ohne dass man auf Kemper & Co. zurückgreifen muss. Vor allem macht das Spielen auch über Kopfhörer total Spaß, man hört extrem viele Details vom Amp und durch die sinnvolle Bedienung ist man nicht nur am Knöpfe drehen. OX löst glaube ich für viele Leute eine Menge Probleme. Die Klangqualität lässt keine Wünsche offen - unglaublich. I played before with a Shure reactive Load and custom IRs and a computer to get a well sounding result. Now you only need your amp and the box, that's all. Se possibilities are endless if you are able to combine the cabinets with the micros and varying the micro position and using the room hall. Playing directly from the amp into your headphone or monitoring boxes. It's so easy. And in the feature there will be more. Well done! And IRs aren't the future, the future starts here! Oh, sure, it sounds good. So do other load boxes, including less expensive, more flexible and upgrade able options. UAD is marketing this overpriced pig like crazy because their plugin business is out of cool gear to model. This device is headed for the black hole in the closet along with Gibson’s FirebirdX. Technology too costly and too late for what it hopes to do. The fatal flaw of the Ox is it’s closed design, not allowing the use of other IR’s. You will get sick of the included choices and lament not having access to new great tones. Expensive door stop. It sounds incredible, but I do a lot of genres. No V30s at launch was disappointing. I’ve had it awhile now and the lack of cab updates has skipped past disappointing to lazy. Get your act together UA. I was definitely skeptical of this product--for 2 reasons really. The first was that I couldn't find any demos showing off the Ox's ability to handle really high gain metal and hard rock tones. The 2nd reason was that the Ox doesn't come with any v30 speaker options. I can say firsthand that this box handles high gain tones better than any load/IR combination that I have tried to date. As far as the v30s, I'm not too heartbroken, as the modern Marshall 4x12 options work wonderfully for heavy sounds. I was on the fence so I figured that I would just order it from Sweetwater and return it if it was nothing special. Well, I can't return it, because I am already in love with this thing. It's worth the money. I ran my Bogner Uberschall through it on day one and I was blown away. I still want UAD to add v30 options, but I'm certainly good for now.